If you have ever been to Vancouver and are into sweets chances are you have heard of Thomas Haas. He is quite a famous pâtissier in the city and makes the most wonderful chocolates. He also creates my favorite cakes and pastries in Vancouver. There are two store locations, but you can also find his chocolates at several food stores. I am also proud to say that he is a fellow German. One recipe which was all over the internet were his chocolate sparkle cookies, named as one of the best chocolate cookies from the LA Times. They are wonderfully moist and very chocolatey. For today I made his pear and almond tart with black currant jam. 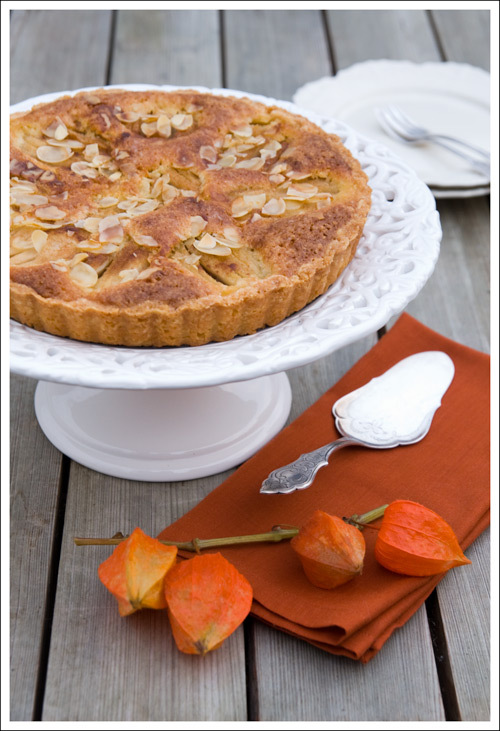 It is a wonderful tart for the fall season. The almond cream is so rich and buttery that it melts in your mouth. The tart has a few steps involved, but is totally worth the effort. The recipe was for one 9-inch tart, but I had enough to fill three more little tartlet forms. And on a side note, I wish all my American readers a very Happy Thanksgiving today. For the shortcrust put the flour, sugar, salt and butter in a food processor. Pulse a few times, then add enough egg until the dough holds together. Form a ball, wrap into cellophane and put in the fridge for about one hour. Cream together the butter and sugar in a stand mixer using the paddle attachment. In another bowl mix together the ground almonds and the cornstarch. Add this mixture alternating with the eggs to the butter mixture. Just mix until combined and be careful to not over-mix. To make the poaching liquid, pour sugar into a heavy pot on medium heat. When the sugar starts to caramelize stir slowly with a wooden spoon. When the caramel reaches an amber color start to add the water. Be careful doing this since it will splatter. Stir until the sugar is dissolved. Add the star anise, vanilla bean and the lime and mandarin juices. Peel the pears and remove the core from the bottom. Add the whole pears into the poaching liquid and let them simmer until tender. Remove from the heat and let cool. Preheat the oven to 170°C (325°F). Grease your tart pans lightly with some butter. Roll out the dough on a lightly floured surface into a round shape to fit into a 23 cm (9-inch) tart pan. Put it into the tart pan and cut off any excess dough. Reserve the rest of the dough for some small tartlets. Warm up the black currant jam and spread it on top of the tart. The jam should not be hot, just warm enough to be spreadable. Carefully spread the almond cream on top of the jam layer. The tart pan should be filled to three-quarters. Cut the poached pears in half. Remove any remaining core. Now cut each pear half in small slices, keeping the slices together and arrange on top of the almond layer. 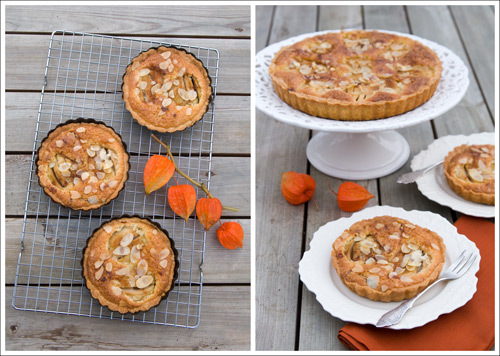 You will need approximately 5 pears for the big tart, and one pear for each small tartlet. Sprinkle the tarts with the slivered almonds and dust with some cinnamon. Bake in the oven for about 45 to 60 minutes, or until the center of the tart is set. Remove from the oven and let cool on a wire rack.